The whole-home audio market just got one more competitor: San Francisco-based consumer electronics startup Beep officially unveiled its first hardware product Thursday. The device, simply called Beep as well, is an audio adapter that turns any stereo system into a set of connected speakers capable of streaming music from the cloud. Combine multiple units in your house, and your music will automatically play synchronized. 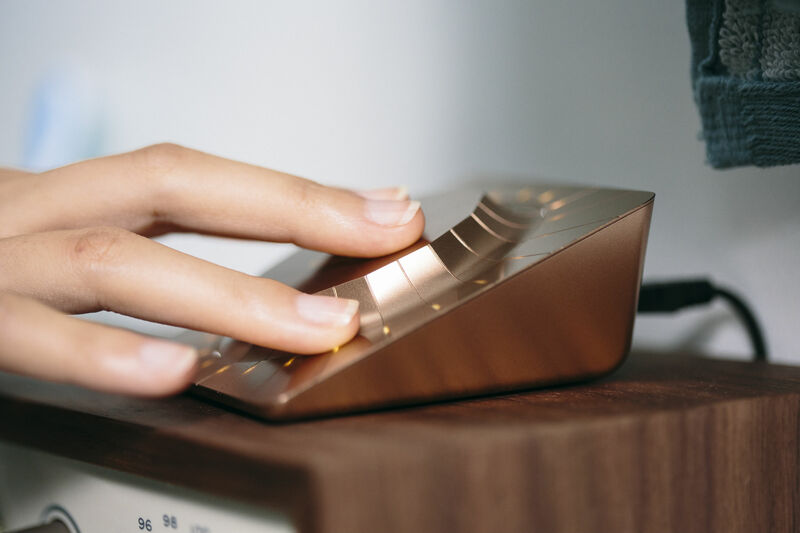 Beep is entering an increasingly crowded market, but the device easily stands out: It’s essentially a copper clickwheel that can be used to adjust the volume of whatever you’re playing. Tap it once, and the music starts. Tap it again, and it stops. Status and volume are indicated with a set of LEDs integrated into the clickwheel that starts flickering in anticipation as soon as you turn Beep on. It’s fun, it’s affordable — Beep will be available for a time-limited pre-order price of $99 – and it’s definitely very geeky. That’s not a coincidence, considering Beep’s roots: The company was co-founded by Daniel Conrad and Shawn Lewis, who both previously worked on Google’s (s GOOG) Android team. 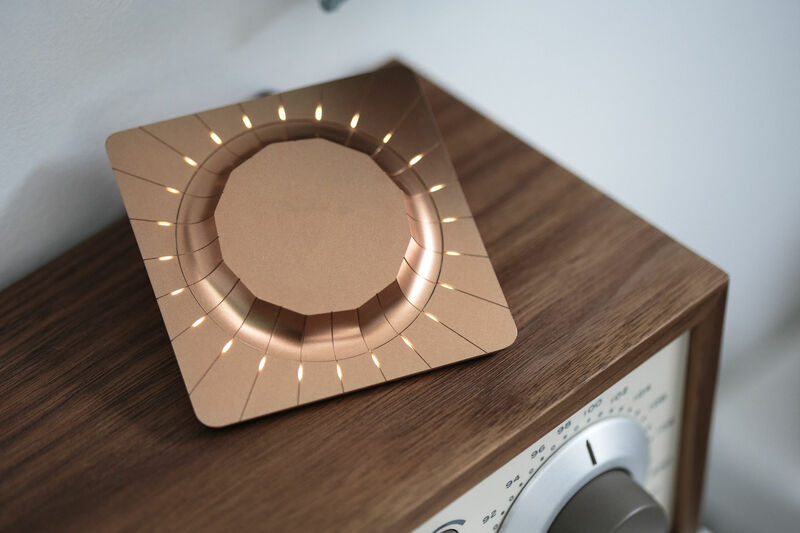 With that background, Conrad and Lewis wanted to create a standards-based whole-home audio solution that integrated with third-party mobile apps. To do so, Beep approached Pandora — and ended up running in open doors. That’s because the folks at Pandora had been thinking about a better way to do whole-home audio for some time as well. The web radio giant learned the hard way that getting into the living room requires a standards-based approach: For years, TV makers all used their own, proprietary smart TV platforms, resulting in Pandora apps that looked and worked differently on every screen — a nightmare for Pandora, especially when the company wanted to update features. Pandora solved that problem by rolling out an HTML5 web app for TVs and connected devices last year — and now, it wants to take the same approach to the whole-home audio space. Instead of once again supporting dozens of proprietary solutions, Pandora simply wants device makers to render their HTML5 app on their connected speakers. Think of it like a browser for your speaker, if you will. “This is our answer for network-connected speakers,” said Pandora CTO Tom Conrad (no relation to Beep’s Daniel Conrad) at CES in Las Vegas last month. The first device to use this approach is Beep, and Pandora actually had some Beep devices on display in Las Vegas in January. Back then, Tom Conrad showed me Pandora playing on his phone. He proceeded to touch the cast button that’s also used by Chromecast, selected a Beep device as an output, and the music started playing. Beep doesn’t just share the button with Chromecast. Just like Google’s popular TV stick, Beep outsources most of a service’s UI to the mobile device. And just like Chromecast, it accesses most media from the cloud, which means it continues to work even if the phone is turned off. “We are thinking Chromecast is the right approach,” Beep’s Daniel Conrad told me during a recent meeting. Unlike Chromecast, which is starting to gain traction with music app developers as well, Beep doesn’t currently have a whole lot of services on board. For its pre-launch unveiling, the company is only announcing compatibility with Pandora, but Daniel Conrad told me that additional services are going to be announced in the coming months. Beep is scheduled to start shipping in autumn, and will at that point retail for $149. Beep’s Conrad told me that he eventually wants to work with speaker makers and other consumer electronics companies as well to help them integrate cloud music into their devices. But for now, the small company is focusing on the iconic clickwheel adapter. “This is a great place for us to start,” said Daniel Conrad. And, one could add, it’s also a way for Beep to be at the forefront of standards-based whole-home audio. Speakers must be powered , beep is not an amp. If it’s not compatible with Chromecast (Google’s Cast technology) then I’m sceptical too. I have Sonos and I love it, but the thing I hate about my Sonos is that it can’t use third party apps. Everything needs to be done through their app. Sonos should develop a “casting” functionality similar as chromecast. So it’s sort of like an apple airport express with an on/off and a volume button? So presumably with an iPhone or apple laptop, you’d find this thing with Airplay, and have it plugged into your music playback device. It would allow you to turn it on and off without doing it on the source. I guess it’s nice, but then, you can just turn the volume up/down, or on/off on the sound device (like the tivoli radio pictured here).